FOCUS3D tiles are an elegant acoustic solution to reduce reverberation time and increase speech clarity in commercial interiors. The eye-catching designs are contemporary and very durable. The clip system allows tiles to be swapped out easily and FOCUS3D tiles meet fire requirements Group 1-S. 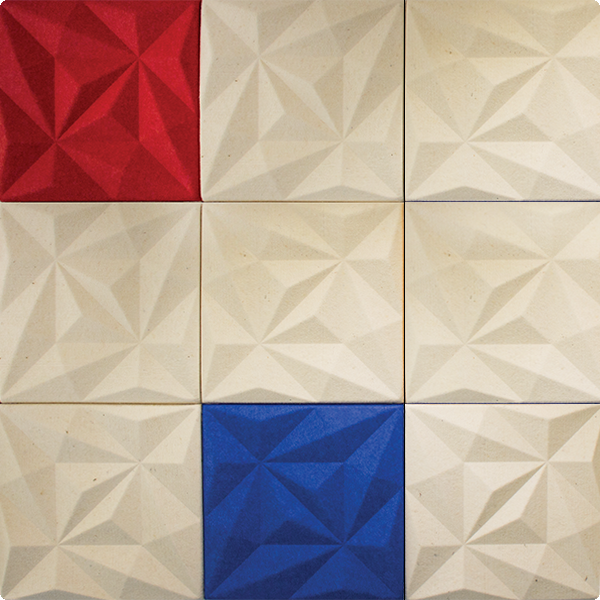 When specifying FOCUS3D tiles, architects looking for a point of difference in their designs can be confident that they are getting a quality hand-crafted product made in Wellington, New Zealand. Focus 3D perfectly compliments the Floc 3D range and can be used to add contrast to a woollen Floc array. Suitable for cafes, restaurants, offices, boardrooms, classrooms, and as a retrofit option.